For those who like dessert and are going to go to Bali in the next trip, don’t worry. It is because Bali not only serves a really good view and scenery, but also good food includes dessert. It has been several years since there are many food influencers start to make their own businesses in Bali. That is why it will be quiet easy for you to find the cozy place for hanging out in Bali. Dessert usually becomes most favorite food, especially for woman and youth. 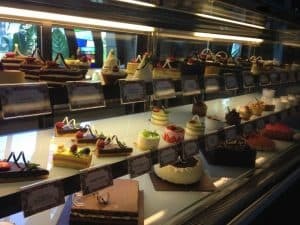 In Bali, there are many fancy café that serves unique dessert. You just need to sit tight and wait for your order comes. 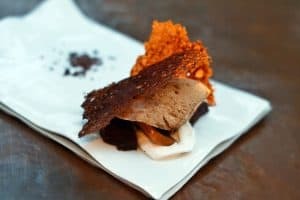 Here are the lists of places for unique dessert in Bali. This café is located in Kerobokan. No wonder, that this place is very popular with many people, especially women. That’s because the place is very cute with shabby chic nuances. This cafe serves a very interesting and different dessert. Especially about the appearance of the beautiful food. Pig cakes are sure to be sought after by many people because they are cute and adorable. Besides that there are still lots of cute cakes and of course it will definitely attract your hearts to try. You should also try to taste some of drinks that are also available there. I’m sure they will make your day. 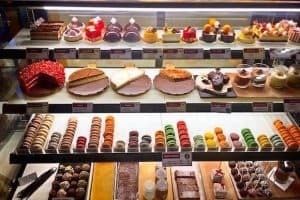 Have you been to Angelita Patisserie yet? Folie is one of the top restaurant hits in Bali that has very various good food. Moreover, the place is also cool with a blend of pink and blue. No wonder if this place has always been a favorite photo spot. The dessert provided here is also diverse. It will definitely confuse you to choose. What’s more, the food is pretty and colorful. Here, you can choose cake or pastry. However, the favorite of most people in Folie is Ham and Cheese Croissant. Anyway, you’re guaranteed to be satisfied with dessert at Folie. 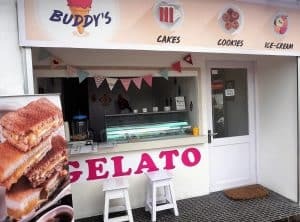 Here you can enjoy various kinds of Gelato flavors. Starting from international flavors such as: Blueberries, Cappuccino Choco Chips, and Rum Raisin. But what’s funny, they also have Gelato with very Indonesian flavor named Cendol and Es Teler. The texture of the gelato is soft. You only have to pay IDR 18,000. Besides Gelato, here also provides light dishes such as Ayam Rica Roasted Rice, Baked Noodles, and Grilled Sausage snacks, etc. It turns out that the place is close to campuses in Denpasar, Bali. So surely the price is very affordable for student pockets. Yamuna Pastry is one of the favorite places for most young people when looking for cake and dessert. Yamuna is present every weekend to pamper your tongue with various types of cake. The place is quite small, but very cozy. That will definitely make your mood better and happier. Even if it’s only open at weekends, you can still order cake or pastry every day, so don’t worry. For those who want to go this place, you can go at Jl. Tegal Cupek II, Kerobokan. It just opens on Friday and Sunday at 12 pm-6pm. Don’t forget to forget your diet and go to Yamuna first. In Room 4 Dessert, you can sample the best dessert menu of Goldfarb’s concoction that uses local ingredients and combines a typical Western dessert with typical Balinese desserts. Here they have 9 mainstay dessert menus, including the Black Sticky Pudding Passion You which uses rambutan, passion fruit, and chia seeds. There is also Sugar Refinery 2.0 which has the sensation of brown sugar, mangosteen juice and Balinese beans. Which one is confused? Here you can find a Remi Tasting saving package, where you can try the entire dessert menu in mini size. The uniqueness of the menu from Room 4 Dessert itself is the experience of enjoying the Dessert. There is a change in taste that is quite interesting when you have just eaten the work of Goldfard, until you swallow it. Each dessert leaves a unique after taste on your tongue. Must try! If you are looking for a dessert in Ubud, you can just go to Caramel Patisseries & Café. This cafe is the favorite of many tourists in Ubud. Although the place is quite small, you can still enjoy a variety of dessert on the second floor where it faces directly onto the street. Not only do you need to enjoy the cute and unique cake you also need to try the drinks that are fresh and certainly different from the others. One of them is “Kietna”. This is a kind of unique drink that uses Calamansi type oranges. For those who are curious about this fancy place, you can immediately stop at Jl. Hanoman No.4B, Ubud. It just opens on Wednesday until Monday at 10am – 9pm. For those of you who are looking for a beautiful place to enjoy your Dessert, then Gardin Bistro & Pattiserie is the right place. In addition to its diverse dessert offerings, Gardin’s interior design is very attractive, surrounded by magnificent glass windows to the ceiling and exhibiting views of the green and lush garden outside. Then back to the topic of Dessert, here you can submit to a series of beautiful cakes like Orange Florentine, Carrot Cake, Banana Nutella Tart, Raspberry Cheesecake, and others. You can stop by at Jl. Petitenget No.106, Seminyak – Bali. Don’t worry, because Gardin Bistro & Pattiserie is open every day from 11 am to 1 am. Ever heard of Nitrogen Ice Cream? Using nitrogen, there will be less ice flowers arising from the freezing process, so you will enjoy ice cream with a softer texture! It truly exists in Bali, one of the Gelato players with the process of making a nitrogen ice cream called Creamery. The store’s outside appearance looks simple, only a brick hut with walls dominated by white and aqua blue. But inside, you can enjoy interesting ‘attractions’ in a class of chemical practices filled with cold steam. This is how they make Decadent Creation which becomes a special signature and is guaranteed to make you addicted. You can come to No.8 Canggu Berawa Beach – Bali if you are curious. As one of the old cafes, Bali Bakery is no stranger to the ears of dessert cake lovers in Bali. 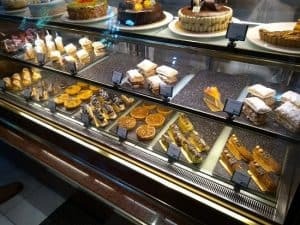 The restaurant which has been established since 1994 is famous for having a range of cake creations with international flavors such as: Guava Cheesecake, White Truffle, Tiramisu Cake, and many more. Not only offers dessert, Bali Bakery also provides a choice of main course menus as well. 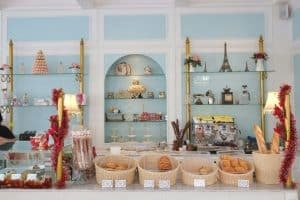 In addition to a varied and quality menu, Bali Bakery also has a cozy and cool interior. No wonder many families and friends do social gathering or business meetings here. You can come directly to Jalan Raya Kuta No.65, Kuta – Bali. This cafe is open Monday – Sunday at 7:30 a.m. – 10:30 p.m. 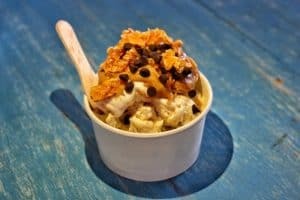 Frozen Yogi is one of the first to bring Dessert with the concept of frozen yogurt or it is familiar with froyo (take as much as you want) in Bali. 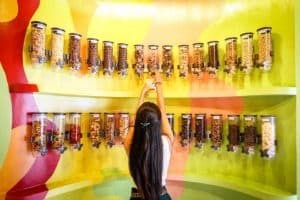 With the concept of self service, visitors will be given an exciting experience when taking their own froyo portions and toppings they want. Later this froyo will be weighed and priced according to the weight of each. So remember, when you take toppings, not too much. For taste choices, you don’t need to worry, because here there are many basic froyo choices such as Vanilla, Coffee Hazelnut, Blueberry, Durian, Red Velvet, Chocolate, Plain Tart, and Green Tea. Now if the choice of toppings is even more, there is a snack chocolate like M & M, cereal, gummy bear and fresh fruit. The final step is to add sauce. The most favorite sauce is Nuttela sauce. You can directly come to Kayu Aya (In front of Seminyak Square), Seminyak – Bali, don’t worry because they are open every day, 10:00 am – 10:00 pm. Those are some recommended places for hunting delicious unique deserts. For the price range, don’t worry since all of them are still affordable enough for student and youth. So, when you are boring with your hotel menu, you can go there to eat a really delicious food.